Overview / Distribution ... Alternate (Global) Names .. The Pelagic Cormorants (Phalacrocorax pelagicus) are also known as Baird's Cormorants, Pelagic Shags or Violet-green Cormorant - due to the violet-green iridescence (sheen) to their otherwise dark plumage. These small, slender cormorants are found along the open coasts of the northern Pacific. Outside the breeding season (in the winter), they also venture out into the open ocean. They are most easily recognized by the way they perch with their wings spread out to the sides to dry them after a swim. These marine birds are very adept in water or in flight; they are able to jump straight up out of the water into the air. Yet, on land they are quite clumsy and walk with a high-stepped waddling gait. As they land, they usually scratch the ground and when they feel threatened, they will dart the bills at the opponents, shake their heads and make gargling noises. They are closely related to the Red-faced Cormorants; with whom their ranges only overlap in Alaska. The Pelagic Cormorant occurs along the shores and islands of the North Pacific. Their range stretches from Alaska and its offshore islands (including Aleutian and Bering Strait islands) south to the northern Baja California in Mexico; and west into northeastern Asia; where they occur from the Russian Far East Chukchi Peninsula via Sakhalin south to Kamchatka, to Ky?sh?, Japan. Vagrants have been reported in the Hawaiian Islands. Those occurring in temperate and subtropical regions are mostly permanent residents, only dispersing locally after breeding. Subarctic populations are migratory, usually overwintering further south. Range: British Columbia to northwestern Mexico. 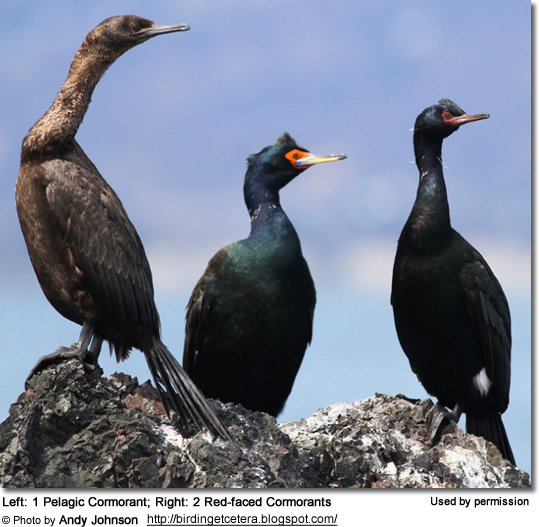 [Kenyon's Shag or Amchitka Cormorant (Phalacrocorax pelagicus kenyoni / Phalacrocorax kenyoni - Karl W. Kenyon, 1959)] - usually considered invalid. Extinct. Described in the late 1950s from the bones of two or three individuals snared in fishing nets at Constantine Harbor on Amchitka in the Aleutian Islands. This race is believed to have gone extinct in the 1960s-1970s, possibly due to marine pollution and overfishing. [Violet-green Cormorant (Phalacrocorax pelagicus robustus - Hobson, 1997)] - usually considered invalid. Range: Prince William Sound region in the Gulf of Alaska on the south coast of Alaska. Smaller than other cormorants, they measure about 20.1 - 35 inches (51 - 89 cm) in length. Their extended wings are about 39.4–47.6 inches (1 - 1.21 meters) long. Large, long-bodied water birds, but small in comparison to other cormorants. Thin, long neck and dark, very slender bill with a hooked upper beak. Non-breeding plumage is solid glossy black. The bare facial skin is a vivid magenta. Feet are large with all-webbed toes. Often perch with wings spread out to dry them after a swim. In flight, hold the neck straight out. Males and females look alike, except for females being slightly smaller in size. Black-plumaged adults have white rump patches that are seen in flight. Flat (not glossy) brown plumage that is turning into slightly lighter brown on the underside. They lack the crests of the adult. Most other North Pacific cormorants and shags are larger. Also, it is the only cormorant within its natural range with conspicuous white patches on its flanks during the breeding season. Double-crested Cormorant is larger, with a thicker bill, and has conspicuous pale facial skin, usually orange. Juvenile has uniformly pale upper breast. 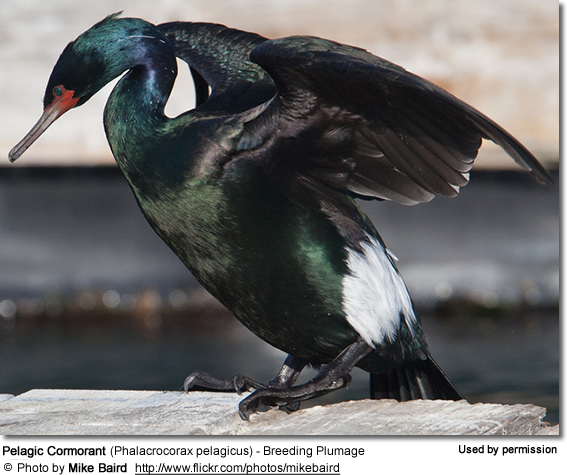 Non-breeding birds are very similar to the Red-faced Cormorant with whom they share the range only in Alaska. In the breeding season, the Red-faced Cormorant has a red forehead and a larger, slightly yellowish bill. Their bare skin extends above the bill. Immature birds look identical except the Red-faced Cormorant can be identified by the thicker, paler bill. The Pelagic Cormorants usually call out before taking off - particularly during the breeding season (the Red-faced remain silent). Loons lack the hooked bills of the Pelagic Cormorant. Pelagic Cormorants usually forage alone in sheltered inlets and bays in the vicinity of kelp beds or among rocks, and outside the breeding season venture out to fish at sea. They mostly feed on various small fish - typically bottom-living and non-schooling - including Ammodytes sand eels, sculpins (Cottidae), gunnels (Pholidae), Sebastes rockfish, pollocks, sandlances and others). They also take crustaceans, including crabs, shrimp and worms. They usually swim until they locate prey and even though they prefer shallow waters, they may dive to depths of 180 feet (~55 meters) or more from the surface of the water down to on or near the seafloor, propelled by their feet and steering with their wings as they pursue their prey under water. Fish are generally grabbed in their bills, without spearing them. After swimming or feeding in water, they return to a dry place to preen and dry their feathers, adopting their typical, well-known spread-winged posture. Pelagic Cormorants reach reproductive age when they are about two years old, and have been recorded to breed until they were nearly 18 years old. Most nesting activities are reported in May or June. Males will perform elaborate courtship displays to attract females, which involve arching the neck and hopping, pointing their bills up, moving the head up and down, lifting the folded wings and fluttering them to show off the white patches on their flanks, and hopping, as well as repeated "yawning" displays, during which the male throws the head back as he calls out. They breed either in small, loose colonies together with other cormorants and other seabirds or solitary, far away from any nearest neighbors, on steep, remote, rocky coasts or on offshore islands, They nest on narrow ledges of steep, inaccessible, rocky cliffs, where they are safer from predators. However, safe nesting sites are increasingly more difficult to find. Their compact shallow bowl nests are piled up seaweeds, sticks, mosses, grass and marine debris and held together and cemented to the cliff face by the birds' own excrement (feces and urine). These nests usually have a deep hollow indentation in the center, which is sometimes lined with feathers. These nests may grow up to 5 - 6 feet (1.5 - 1.8 meters) deep and are often reused over several breeding seasons, or pairs may alternate between two or three nesting sites - repairing and/or rebuilding upon a nest before the nesting season commences. They usually produce one clutch a season, but may replace a lost brood. The average clutch consists of 2 - 7 bluish-white eggs (mostly 3 - 4) and the parents share the incubation of the eggs for about 31 - 34 days (some resources list the incubation to last only 3 weeks, others as long as 38 days). This may also depend on environmental conditions and the experience and diligence of the parents. If parents don't brood as continuously as they should (which may be the case with inexperienced birds in particular), the development of the embryos is likely to slow down, especially if the outside temperatures are on the cold side. Hatchlings weigh about 1 oz (35 g) and are completely naked. However, within days, they grow sooty-grey down feathers. Both parents feed and protect the young. The juveniles fledge (leave the nest) when they are about 50 - 60 days old. Male and female vocalizations are mostly identical except during the male's "yawning" (courtship) display.